Those are just two advantages anyone working in radio sales must tout when selling radio advertisements over other forms of media. The key to selling radio ads is to convince your clients that they need them. The best way to do that is to show them the bottom line. Inexpensive or free production costs can seal the deal with a client. At many stations, the person who sells the spot writes the script. Most ads need only a solid radio personality to act as the announcer. You might add some bells and whistles with background music and sound effects, but stations can obtain stock versions of both at low cost. Since the salesperson and announcer already draw salaries as part of the staff, the production cost to the station is minimal. That means the station can waive any fees it might charge for the ads if the client agrees to purchase a certain number of spots. You also can save money for your client by acting as a consultant. If they want to lavish money on some well-known voice to make the on-air pitch, remind them that the expenditure won't automatically boost their sales result if people don't recognize the high-priced vocal talent. If the client wants to play a more active role and produce a spot that you know will fail, gently explain what will work for them. You might point out how the best radio ads incorporate the six types of media advertising. Television or newspaper advertisements can take weeks, if not months of production before the target audience ever sees them. Radio advertisements can be written, produced and aired all in the same day if a station has open advertising slots on its program log. Those availabilities or "avails" are hard to get during the December shopping season but should be easy to offer during the rest of the year. You can use expediency as a key selling point. If it's late August and a clothing store is late launching the Labor Day sale for its fall fashions, it still has time to mount a successful radio advertising campaign. Getting a TV commercial on the air or in the print media on such short notice can be mission impossible. Make that work for you. Many potential clients may be confused by the term "target audience" because they want to sell their products to everyone. That's why they often waste money on ineffective newspaper or TV advertising that doesn't reach their potential customers. Radio formats make targeting an audience easy. Most business owners instinctively know if the people they want to reach; listen to hip-hop, country or sports radio. If a car dealer wants to move pickup trucks off the lot and you sell radio advertising for a country music station, you likely won't have to spend time convincing the dealership that your station is the right place to advertise. However, you may have to show other prospects why matching the client to a target audience is critical to getting results. If you work for a cluster of radio stations, you can work a deal with the pickup truck dealership for the country station, and then go next door and sell ads for a sports bar on your sports radio station. Radio is ideal for that sort of smaller, targeted campaign. Another advantage of radio advertising advantage is its low CPM, or "cost per thousands," rate. Explain to your clients why the world's slickest, most creative advertisement won't boost sales if it runs only one time unless it appears during the Super Bowl. An ad must repeatedly air if you want the sales message to stick in the audience's brain. 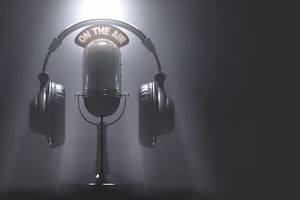 Radio advertising provides the opportunity to repeatedly air the client's message multiple times throughout the day at relatively minimal cost. By the time a listener hears the same ad five times on the way to work and another five times on the way home, she will know the car dealership is great deals on the most rugged pickup trucks that money can buy. Advertising rarely works when the sales message is muddled. Readers will overlook a newspaper ad that is lost on whatever clutter crowds the rest of the page. TV ads often have so much going on -- music, pictures, flashy editing -- that viewers don't know where to place their focus. Radio advertising demonstrates that a simple message is usually the most effective. A restaurant offering 99-cent tacos on Tuesdays can use the 10-, 15-, or 30-second ad to simply state, "Come get great-tasting tacos for 99 cents every Tuesday. Here's where to go." The listeners can't see the tacos, but that's where effective advertising copywriting can use words to paint the mental image of fresh, hot, spicy, crispy, tacos filled to the brim with delectable goodies. Radio advertising offers a wealth of advantages over other forms of media. Emphasize each of them, and you'll persuade clients to buy spots on your station that will increase sales and decrease their expenditures. Has Your Small Business Considered TV Advertising? How Do Radio Formats Affect Advertising?